The Calgary Stampede Parade in Calgary, Alberta is a huge event every year and a cowgirl and her two dogs in a horse drawn carriage are one of the attractions in the parade. Hundreds of entrants take part in the parade which is a great way to kick off the Stampede where thousands of cowgirls and cowboys spend their time every year. 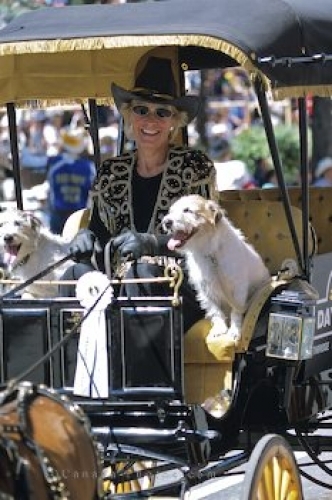 Picture of a cowgirl and her two dogs riding along in the Calgary Stampede Parade in Alberta.